It looks like gcc itself is segfaulting. I just tried installing the headers for original Pi (also armv6l) and it went just fine (with gcc 4.9.2). You might try running "make -C /usr/src/linux-headers-4.4.16+ modules_prepare V=1" to get a better idea where it fails. marqs wrote: It looks like gcc itself is segfaulting. I just tried installing the headers for original Pi (also armv6l) and it went just fine (with gcc 4.9.2). You might try running "make -C /usr/src/linux-headers-4.4.16+ modules_prepare V=1" to get a better idea where it fails. From the log it seems you're now running kernel 4.4.11+ which does not have updated header packages (e.g. missing timeconst.bc). Tried installing on latest RetroPie (4.0.2) - worked like a charm! ...has anyone actually gotten these working with UAE (either version)? If so, what's the trick? I can't seem to get them to work, nothing happens (works fine in ES GUI). Soullous wrote: Thanks. I updated to 1.1. I'm not sure exactly what changed, but the buttons on all of my controllers (PS1 and PS2) seem to have a mind of their own now. They all seem to be registering randomly, as soon as the controllers are plugged in, and actually pressing the buttons seems to have no effect. I did try changing the psx_delay from 10 to 25, and then to 50, with no effect. I modified the new version so that tweaking psx_delay is no more needed (and has no effect). I made a new test today, using RPi v2 (used RPi1 originally) and testing different pins. I think I found the reason why some people are having problems with PSX controllers: the internal pull-up resistors are not sufficient for reliable operation. The solution is to use gpio pins P1-03 or P1-05 for the data line (1.8kohm onboard pull-up). If more than 2 controllers needs to be plugged or if those pins are used for something else, an external pull-up resistor (anything between 1.8k-4.7k should be fine) must be added per each additional data pin (GPIO4 / GPIO7) and 3.3V. Tested 2 different controllers with driver version 1.1 using that setup, and everything worked reliably. Analog sticks registered slight random movement at rest though, but that might be a controller "feature" and can be filtered out with suitable deadzone settings. hi sir Marqs, I'm a Raspberry Pi 2 Model B+ user and currently using Retropie. I'm having trouble connecting my PSX GamePad SCPHC1200 to Pi using GPIO. Edit: I only have one gamepad. yes it was red by my system. Q3: when I try jstest0 or jstest1 I get a response that both gamepads are active, but when I do to push button(triangle X, Circle, Square) there is no right response some should be "yes" if I pushed any of this right? Q4: regarding your post in my quote I wanna know how to setup wires correctly because I believe it was the missing object. Q5: can I request for a clear Schematic Diagram on how to configure wires onto Pi's Pins. thank you for reading and bear with my English I'm not a good in English. I will have a further more questions hope I can hear from you soon. That is all for this time being. Scias wrote: hi sir Marqs, I'm a Raspberry Pi 2 Model B+ user and currently using Retropie. I'm having trouble connecting my PSX GamePad SCPHC1200 to Pi using GPIO. A4: If you use GPIO2 or GPIO3, there is no need for external resistors. yes sir Marqs. you are right in your presumption in your A2. I previously configured Generic USB Gamepad. I configured USB first, I think that is why I'm having problems? I tried to map my driver using map=0,0,0,0,7,0 and still 0/0 PSX Gamepad Configured appears when I try to launch a PSX game the with jstest and menu set Input, there is no right response from gamepad. please help. Is it possible to create a version of the Gamecon driver that is compatible with the GERT VGA 666 board? The GERT board has GPIO 22-27 available (note those are NOT the physical pin numbers, they are the internal GPIO numbers). Unfortunately this modification is beyond me - I have no experience building linux drivers and deciphering the bitwise operations and pointers in the gamecon driver left me a bit lost. Scias wrote: yes sir Marqs. you are right in your presumption in your A2. I previously configured Generic USB Gamepad. I configured USB first, I think that is why I'm having problems? I tried to map my driver using map=0,0,0,0,7,0 and still 0/0 PSX Gamepad Configured appears when I try to launch a PSX game the with jstest and menu set Input, there is no right response from gamepad. please help. Does the DualShock led light up, and are all button values stuck to off in jstest? munskey wrote: Is it possible to create a version of the Gamecon driver that is compatible with the GERT VGA 666 board? The GERT board has GPIO 22-27 available (note those are NOT the physical pin numbers, they are the internal GPIO numbers). Unfortunately this modification is beyond me - I have no experience building linux drivers and deciphering the bitwise operations and pointers in the gamecon driver left me a bit lost. Depending on RPi model, 5 or 6 pins from GPIO 22-27 are routed to gpio header which would be enough for 3-4 NES/SNES controllers. The driver would then need be customized just for this purpose by changing values on a couple source code lines. I can post the required changes here along with rebuild commands next week when I have more time. Then recompile the driver by running make in /usr/src/gamecon_gpio_rpi-1.2 directory. Now you can load the modified by running "sudo insmod /usr/src/gamecon_gpio_rpi-1.2/gamecon_gpio_rpi.ko map=0,0,1,1". Is there a kodi 17 add on or a way to get my gamecon snes pads working in kodi? USB pads work on my libreelec kodi partition. Snes pads work in my retropie partition with the gamecon driver. I've posted this on the RetroPie forum, but no responses, yet. Sorry for any cross-posting, but this thread appears to be more dedicated for this driver. There was no feedback that it was successful, or anything, but if I do it again, it reports that it is already loaded in the kernel. So it appears to be loading something. And the joystick does not work. Also in the readme is says for auto-loading on reboot go to etc/modules and add db9_gpio_rpi map=1,1 but after reboot the driver is not loaded. There was a post on the RetroPie forum indicating that loading drivers in the etc/modules is not supported any longer, and it was suggested in that post to create a conf file in etc/modprobe.d/ with contents options db9_gpio_rpi map=1,1 and for that particular post it appears to work that way. But for me that does not seem to auto-load the driver either because after reboot there is no JS0 or JS1 created. so overall it seems that the driver can be manually loaded and does not work, and it is not auto-loaded when rebooted. What else am I missing to get this driver working? The problem is random input - I get random START and SELECT. I was experimenting with the delay, I've seen online the recommended values, but no matter what, I still have issues (I am running Retropie on RSPi 3 B). 1. What psx_delay should I set? 3. Is rumble supported in the driver? today I bought PSX multitap at second-hand shop thinking that if I can make GPIO interface from this. It seems easy for me only one gamepad to connect, but I think whether all four ports can be used if possible. Does wire thickness and length matter much? I soldered a header from an old motherboard onto the SNES controller plate and connected it with a 67cm jumper cable. I checked continuity with a multi-meter on all the points. On controller 1 only "B' button works and it triggers all buttons at once (GPIO4=Pin07). It seems to be a common problem here, Should I start by trimming the wire length or solder them directly to the ports? I tried with the thickest/shortest wire I could find but still no luck. Im having troubles reconfiguring the driver to use different data ports, I really just need to move the gpio4 that uses pin 7 as I'm using a petrockblock power block that occupies that pin. So I dont know if someone still reads this but Im using the db9_gpio_rpi driver for my genesis controller. Working fine right now. the Code for these is based on a python script. The script is working fine as long as the db9_gpio_rpi is not active. If the system is configured for the db9_gpio_rpi it is behaveing strange. GPIO 21 is set as a exit button to terminate the emulator and to return to emulationstation. While db9_gpio_rpi is active it exits the emulator but I get a black screen in emulationstation. So basicly nothing is happening but I can press Start to get to the emulationstation option screen and restart emulationstation. The rest of the GPIOs are configured to load db9_gpio_rpi or unload it and load other drivers for other controllers. Works fine but if db9_gpio_rpi is active, the system just reboots or crashed. I think since both are using the GPIOs there should be the problem but Im not a good enough coder to figure the driver out all by myself. The code for the other script is longer but i can post it too if needed. Update: I tested the exit emulator with the button combo from emulationstation and it is the same thing. Some guides tell to use the 3.3V pin (PI-01) instead, but I had my doubts, since when I used the pad on that, the Analog Light didn't pop up at all. So I'm now using the PI-02 pin instead. So, what possibilities there might be for this error ? Hello! I am trying to change the GPIO location for player 5 and 6 (default pin 2,3) to pin 22 and 23. But it´s not working, could you guide me how to fix it? Is there anything I need to edit on lines 1143-1144? All I changed is the code I wrote. 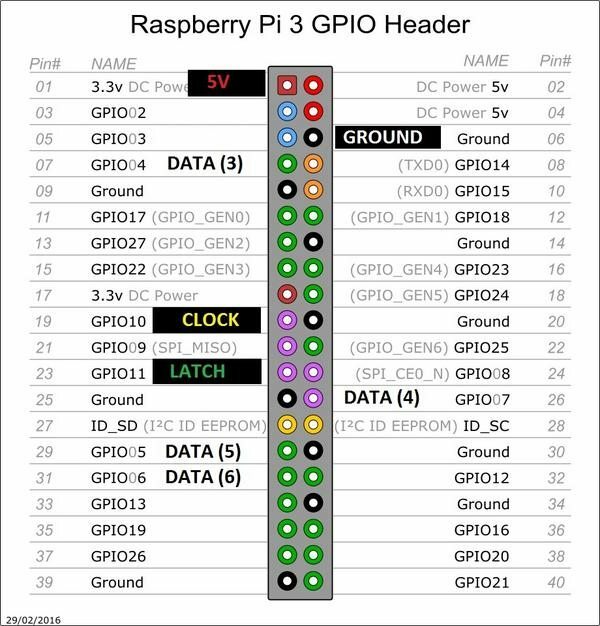 EDIT: I successfully figured it out myself by trial and error, but would like to learn how to define GPIO-pin number codes.